he had completed after a favourite family holiday in France. The scene, which depicted the tree-lined tranquillity of the Canal du Midi, was beautifully reproduced on his coffin and made a unique and very poignant farewell to Norman, much loved husband to Jean and father to Alison. “Dad took up painting when he retired and this picture was especially precious because he painted it for me as a birthday present after we had all been together on canal boat for a day during a lovely trip to France,” said Alison. “A few days before he died, Dad said he wanted a blue coffin and Mum came up with the idea of using his painting for the design. 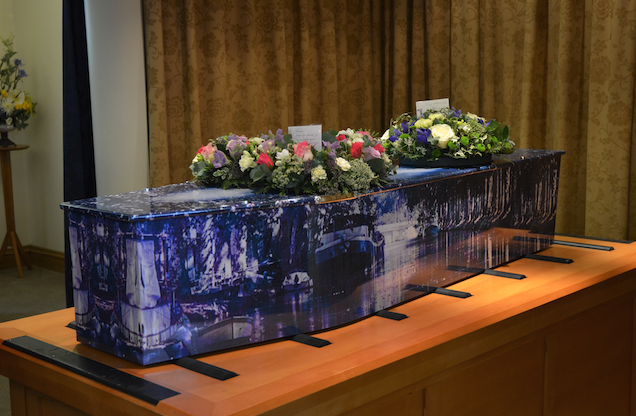 Colourful Coffins were fantastic, when we saw the proof by email we were impressed, but nothing prepared us for just how beautiful the picture coffin was when we saw it for the first time.